How to Make Homemade Pumpkin Butter - Easily! If you have enjoyed pumpkin butter from farms stands, and wanted to make your own, but thought it might be too difficult; guess again! These step-by-step directions will make it so simple, anyone can make better pumpkin butter and at a much lower cost. Now, with a crockpot, it's easy! Prepared this way, the jars have a shelf life of 6 months in the fridge. Note that it should NOT be stored on the shelf, unrefrigerated. I added the statement from the USDA at the bottom of this page and you can see this page for the safety reasons why. A side benefit is that your house will smell wonderful while it is cooking - much better than potpourri! 7 quarts of Pumpkin Puree (See step 1) Note: The yield is usually about 2 or 3 cups of puree per 6 inch diameter pie pumpkin! That cooks down to about half that volume in making pumpkin butter. So for 6 quarts of pumpkin butter, you'd need 5 or 6 small pie pumpkins! Similarly for 6 pints, you'd need 3 pie pumpkins. Step 1 - Make unsweetened pumpkin puree! That's right, pumpkin butter starts with cooked pumpkin! You can use store bought pumpkin puree, but the pumpkin butter won't taste nearly as good. So if you haven't made some pumpkin puree yet start here with how to make pumpkin puree. Otherwise continue to step 2. Fill the crock pot to within 2 inches full with pumpkin puree, mine takes about 5 quarts. Set the crock pot on low or medium heat. Leave it to cook for 6 - 8 hours. How long depends on the size and power of your crockpot, and how thick you like it, If you want to stir it occasionally, that's fine but not necessary. I let mine go overnight. It will reduce in volume by about half overnight. As it cooks down (the next morning), add the remaining pumpkin puree (about 2 or 3 quarts) and 2 more cups of sugar. Then let it cook a couple of hours more to mix the flavors. Now's a good time to get the jars ready, so you won't be rushed later. The dishwasher is fine for the jars, the water bath processing will sterilize them as well as the contents! If you don't have a dishwasher, you can wash the containers in hot, soapy water and rinse, then sterilize the jars by boiling them 10 minutes, and keep the jars in hot water until they are used. Leave the jars in the dishwasher on "heated dry" until you are ready to use them. Keeping them hot will prevent the jars from breaking when you fill them with the hot pumpkin butter. 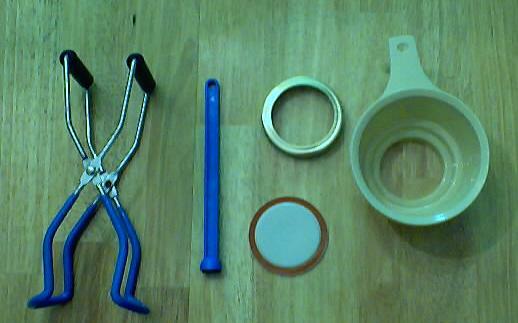 Put the lids into a pan of boiling water for 5 minutes, and use the magnetic "lid lifter wand" to pull them out. You want a smooth, creamy texture, right? The easiest way is to use a hand-held drink blender. It does a great job of making it smooth. You can also put it into a regular blender, but if you are going to do that, you might want to blend the pumpkin sauce before you put it in the crock pot (it will be much thicker afterwards and won't move in a regular blender). Too thick? if the pumpkin butter cooks down too much or is too thick for your liking, just add a little bit of apple juice and blend it in. Fill jars or other containers. Cool the jars to near room temperature (a couple of hours) Then pop them into the back of your fridge, or bags in your freezer! Note about canning pumpkin butter: Home canning is not recommended for pumpkin butter or any mashed or pureed pumpkin or winter squash. In 1989, the USDA's Extension Service published the Complete Guide to Home Canning , which remains the basis of Extension recommendations today, found in the September 1994 revision. The only directions for canning pumpkin and winter squash are for cubed pulp. In fact, the directions for preparing the product include the statement, "Caution: Do not mash or puree." Some of the factors that are critical to the safety of canned pumpkin products are the viscosity (thickness), the acidity and the water activity. Studies conducted at the University of Minnesota in the 1970's indicated that there was too much variation in viscosity among different batches of prepared pumpkin purees to permit calculation of a single processing recommendation that would cover the potential variation among products (Zottola et. al, 1978). Pumpkin and winter squash are also low-acid foods (pH>4.6) capable of supporting the growth of Clostridium botulinum bacteria which can cause the very serious illness, botulism, under the right storage conditions. If the bacteria are present and survive processing, and the product has a high enough water activity, they can thrive and produce toxin in the product. Holt, D. September 22, 1995. Re: Pumpkin butter. Email message to fnspec_mg@ecn.purdue.edu . This complete kit includes everything you need and lasts for years: the canner, jar rack, jar grabber tongs, lid lifting wand, a plastic funnel, labels, bubble freer, and the bible of canning, the Ball Blue Book. It's much cheaper than buying the items separately. You'll never need anything else except jars and lids (and the jars are reusable). To see more canners, of different styles, makes and prices, click here!